Properties in Province of Syracuse average 4.6 out of 5 stars. Casa Pindaro 27, home of light and relaxation ...! Property 11: Casa Pindaro 27, home of light and relaxation ...! Holiday House Antica Tonnara less 50 meters from the sea. 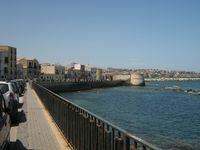 Property 21: Holiday House Antica Tonnara less 50 meters from the sea. Newly renovated apartment with private garden and 2 bikes. Property 40: Newly renovated apartment with private garden and 2 bikes. Gallitto apartments on the sea. Property 47: Gallitto apartments on the sea. Menander house in the heart of courtesy, just a stone's throw from the sea and from the descent to the sea. 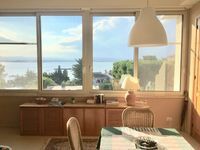 Property 48: Menander house in the heart of courtesy, just a stone's throw from the sea and from the descent to the sea. My family and I recently stayed at this cozy apartment with beautiful views of the sea and Mt. Etna. The apartment is well-equipped and very comfortable. My family and I were able to cook simple meals in this kitchen and enjoyed many sunsets on the patio. Santi is an incredible host! Aside from just being very kind and personable, he also suggested the best beaches to visit, nearby restaurants, etc. We had our own car, which Santi permitted us to park in a private/secure area. The apartment is a short 10-12 minute drive away from Ortigia; a 35 min drive from Noto, and a 1.5 hour drive from Taormina all of we which we visited during our week long stay. There is also a supermarket located 10 minutes away from the apartment. We highly recommend this apartment! I am very happy we chose to stay here. Grazie, Santi! The apartment is compact and novel. The sea view sensational from the bedroom and it had everything for a very comfortable stay, even out of season. Our hosts were delightful; generous with their gifts and time, making us so welcome. Highly recommended!